“How can I make $25 a day online?”, this is a question that I see a good bit while searching the internet. Everyone wants to make money online, but no one ever seems to know where to start. When I started this blog, my intention was not to make money, but over time I started making money without even trying. As soon as that started, and I realized just how easy it was to make money online, I started looking for other ways. Eventually I ran into the Instagc community. Now I know for a fact that you can make a lot more than $25 a day using Instagc, but I am going to start small, because there are some stipulations to making more. You have to take many things into account such as how much time you have to spend in front of your computer or phone, and how many things you will be approved for. You’re probably asking yourself, what does she mean by “approved” for? Well let me explain. The easiest and fastest way to make $25 a day online is by using Instagc survey options. You will head to their survey section (and they have many.) and you will start answering pre-qualification questions. The main types of questions you will be asked is your gender, income, education and occupation. After you answer the pre-qualification questions, the surveys you are trying to complete will alert you if the survey is a good fit for you or not. From that point on you will start making money. So How Much Money Will I Make? The surveys pay anywhere from $0.30-$3.00, while the majority pay $1.00. There are occasions where you will find a survey that pays much more than $3.00, but I won’t lie, it is very rare. One thing I have noticed is the more surveys you complete, the more higher paying surveys will open for you. The amount of money you make depends on the amount of time it will take you. Just last week, I was able to complete enough surveys in a 45 minute time interval that I made $10. That is more than the federal minimum wage, and I only stopped at $10 because I had some other outside obligations. I know had I continued I could have very well hit the $50 mark or more. It all depends on the amount of time you have to spend. How Long Do The Surveys Last? The amount of time a survey consumes is going to determine how quickly you make money. If you are running into surveys that only pay $1 and will take you over 30 minutes to complete, then don’t even bother with them. It will be a huge waste of your time. Most of the surveys I take have a time range of between 10 minutes and 15 minutes. I try to only do a max of 15 minutes. I have taken on a 20 minute survey every now and then. You are allowed to choose if you want to do the survey before accepting it. The estimated time it will take you will be shown before you accept, on most. Why Should I Do Surveys Through Instagc? I am a member of several different survey companies, and I can tell you that I can’t visit every site daily. There are just too many of them. On top of that, some of them only reward you with points, and sometimes those points can’t be redeemed for cash, but rather a gift card or an entry into a sweepstakes. At Instagc you make cash, everytime! Many of the same survey companies that I am signed up with have partner programs and they usually pay folks to promote their company. They do this through referrals. Well Instagc has joined these referral programs and they have made it to where they are all combined into one simple location for people like you and me to complete surveys. Instagc makes money for every survey we complete, and then pay us a little bit for doing it. You may think that it is a rip off and that you could be making what they make to take a survey through the company site, but I assure you, that isn’t so. Most of these survey companies that Instagc use have very high requirements for the companies they pick to partner with, they do this because they know that with more traffic comes more money for them. So they pay these companies like Instagc much more than they would a regular Joe like you or me for referring mass traffic. Where as if you or I referred, it could possibly be only 1-2 people a week. Instagc sends thousands. I want to show you some examples of these sites and what they pay, just to give you a little peek. What Survey Companies Does Instagc Use and How Much Can I Make? Let us take a look at why doing surveys through Instagc is better than doing them through the survey company ourselves. Instagc uses a few survey companies and I just want to go over them and what information I have about them and their partner programs. Live Sample– So when we click this link, it takes us to the page where we enter our email address and as you see, you will be entered into a $10,000 sweepstake for completing surveys. However on Instagc, you will get paid $1.00 for completing the survey, and you can get paid $2.00 a day for completing 2 surveys. Instagc uses a partner program that pays them between $1.05 and $1.20 per lead, which means for each email address entered into that line, they get paid that amount. So they are giving you the majority of the amount they receive and are taking the change. Kind of nice of them in my opinion. But as you can see, you can’t earn any money if you don’t go through the Instagc base. Your Surveys– This company only allows paid surveys through reward sites. There is no other way to complete. 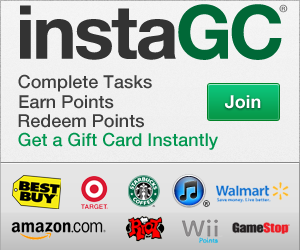 You will get paid $0.70 for each survey you complete when using the Instagc base. You can complete up to 12 surveys through this provider, and you can make $8.40 a day. My Thought Counts- This company provides 2 surveys a day through Instagc. You will earn $2.25 a day when you complete these. This is another site that you can’t sign up for outside of the Instagc base. OxSample Router- This company has 3 surveys you can take each day through Instagc. Once again, it is another site that you can only access through a rewards program. You will make $2.40 a day completing their surveys. Tap Research Surveys– And here is another company you can only access through a reward program like Instagc. They provide 5 surveys you can take daily. You will make $3.25 a day when you complete these each day. As you can see with each of these walls, you will find the survey portions at the top. You can complete the surveys on the top portion and then search through the survey category to find the ones that you feel are best. So there you have it. Surveys through Instagc are the fastest and easiest way to earn $25 a day online from the comfort of your own home. And if you don’t feel like doing surveys you have other options. You can do email submits where you just subscribe to a certain site and be paid, or you can register for services too. You can find some extra information in a previous post I did called How I Earn Free Amazon Gift Cards. As I said before, you can do surveys, email submits, watch videos and so much more. If you own a blog you can earn $0.25 for each blog post you do for Instagc. Instagc works off of a point system. Every point equals $0.01. So 100 points is $1.00. There are 4 ways to get your money. You can either choose from 1 of 243 gift cards with some that have $1.00 gift cards, such as Walmart and Amazon. You can also choose a cash option. Those are requesting a check. You have to have $5 in order to redeem that. You can also choose direct deposit to your bank with a minimum of $5. Once you reach $50, you will have the Paypal redemption opened. You will then be able to redeem $1.00 instantly any time you choose to your Paypal account. I use the Paypal option as they will provide you a debit card to use anywhere! Yes! You can not only refer your friends, but you get paid $0.10 for every friend you refer who confirms their email address, and on top of that you earn 10% of their earnings. It’s a really amazing program so it won’t be hard to refer a friend or two. Are you ready to join one of the top reward programs online right now? If so, come join me! Sign Up Free and you will receive tips via message from me on ways to make up to $2,000 a month using Instagc, as well as point booster codes and more! Hey, there are many ways to make money online! For example if you’re an android developer and have created an application which is popular among users, you can use GlobalHop SDK and make little money without doing anything.